Erin Wright was born in Detroit and grew up mostly in Grand Rapids. The daughter of a special education teacher, Wright knew how demanding and rewarding teaching is as a profession from an early age. After graduating from Michigan State University with her teaching degree she joined the Peace Corps and spent two years teaching and learning on the small volcanic island of St. Vincent. As a Peace Corps volunteer Wright taught computer literacy, health, and special education to adults and children. She says it was challenging to teach in a foreign country right out of college with no support system nearby, but it taught her the importance of ingenuity, tenacity, and diplomacy. Wright then earned her master’s degree in literacy, language and culture at the University of Michigan while also teaching pre-school. While at U-M, she met her husband, Ben, an aerospace engineer. After completing her degree, Ben and Erin moved to Atlanta, Georgia so that Ben could attend Georgia Tech for his master’s degree, During that time, Erin taught 5-8 grade language arts at a middle school in Atlanta. After her husband finished grad school, the couple returned to Ann Arbor to settle down. Wright was hired by AAPS to teach in an emotionally impaired classroom at what was then Stone High School. Wright then worked as a teacher consultant at Pattengill for a few years. 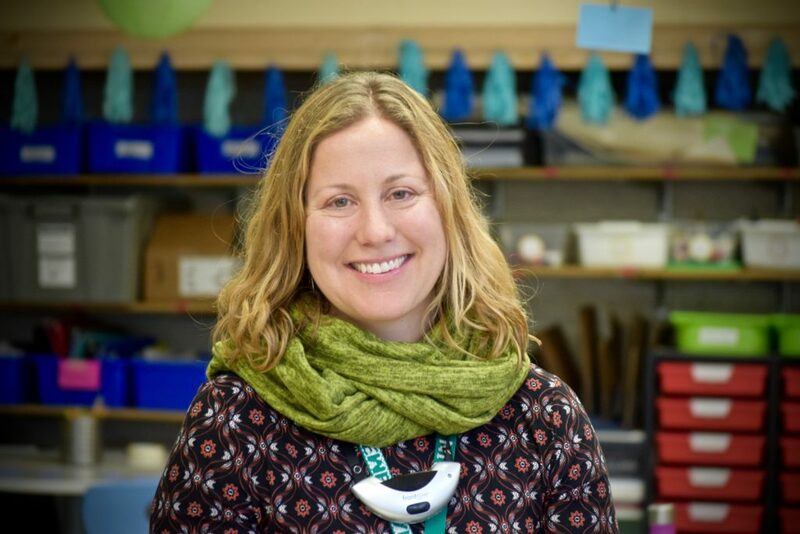 After working in special education for her first four years in AAPS, Wright wanted to spend more time with the students she worked with and switched to being a classroom teacher, first teaching third grade at Haisley and then fifth grade at Eberwhite. Now, with two children, Tucker, 8, and Elsie, 6, she is a busy working mom who says she feels lucky to live and work in Ann Arbor and raise her children in a wonderful community. 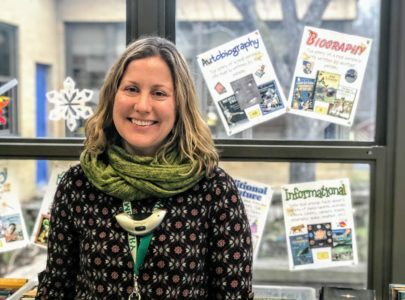 The icing on the cake, she says, is that she gets to bring her kids to work with her as they both attend Eberwhite, where she currently teaches. What inspired you to become a teacher? I love working with children. Their imaginations inspire me, their strong sense of right and wrong reassures me that the world will be ok, and their natural curiosity lights up my day. I originally planned to be a social worker and majored in that my first year of college. However, after my freshman year, I worked as a counselor at a camp for children with special needs. Getting to spend all day, every day with a group of kids was really magic for me. I realized what a positive impact one could have when they have that much concentrated time with kids. As soon as I returned to MSU, I changed my major and applied to the College of Education. What’s the best compliment anyone could give you? That I impacted their child’s life in a positive way. In your 11 years in AAPS, what’s the most important thing you’ve learned about teaching? About learning? I have been a teacher in AAPS for 11 years and during that time, I have learned so much from other teachers. Every teacher I’ve worked with over the years has taught me something new. Whether it was a clever approach to “the pencil problem” or a creative project to do at the culmination of a unit, I have gained so much from my colleagues. I would say the most important thing I’ve learned is to use your amazing community of peers, never be afraid to “borrow” an idea or ask for help. None of us can do this job well alone. Why did you decide to work at Eberwhite? I had taken a year off of teaching to be home with my two young-at-the-time children and was coming back to work. I knew of openings at a few different schools but had a nephew attending Eberwhite whose parents spoke very highly of it. I also knew that Bill Harris was an amazing principal from working with him previously in SISS. As soon as I landed at Eberwhite and saw how friendly and hardworking the staff is, how generous and kind the community is and how amazing the kids are- I knew it was home for me! Now with both of my children attending Eberwhite, I am constantly amazed by the educational experience they are receiving. I’m so thankful to have found this little gem of a school and to share it with my children. I adore Eberwhite’s amazing principal, friendly staff and lovely community. What makes teaching there unique? 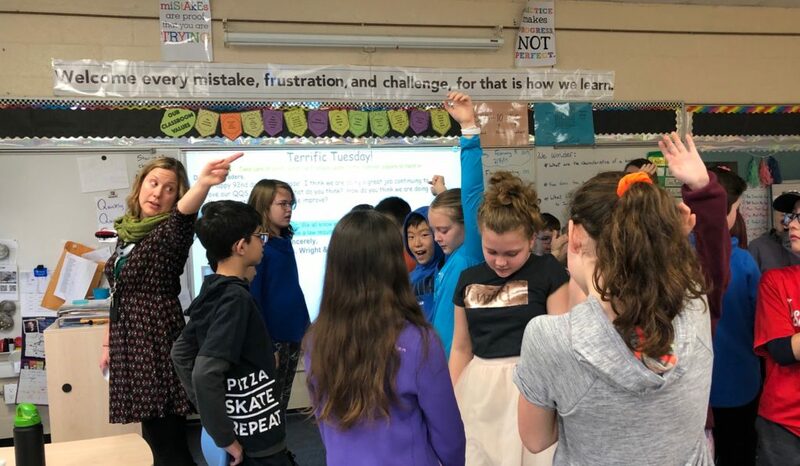 Teaching is a unique blend of structure and routine combined with challenge and spontaneity. No two days are ever the same, but there are comfort and consistency in our daily schedule and predictable expectations. You can be both innovative and a creature of habit in this career. Teaching is also unique because you have the privilege of creating your own little microcosm in your classroom. Your microcosm can play lovely music and emphasize kindness and curiosity. Getting to spend 8+ hours a day in a peaceful miniature world full of kind children who love to learn is the best part of this job. What advice would you give to a first-year teacher? That being a good teacher is not about knowing how to do everything or teaching a lesson perfectly, it’s about loving the process of learning and making personal growth. If you get up every day and think, “How could I approach this lesson with my students? What could I try differently today to engage that one child who has thus far not engaged? What could I improve about my teaching, my attitude, myself? How will I make today better than yesterday?” you will be an amazing teacher. What’s the happiest part of your day? When my students are into a lesson and excited about a topic. When they ask questions that really make me think or have ideas that are outside of the box. When they talk casually about big ideas or concepts that we have learned together. Also, when my own children (Tucker & Elsie) tell me excitedly about what they learned at school. What is the most rewarding part of teaching? The most rewarding part of teaching for me is getting to be a part of kids’ lives. I feel supremely grateful to have a role in their fifth grade year. I get to know their families, their pets, their likes & dislikes, their hobbies, and their dreams for the future. My goal is to send them off to middle school prepared, with a strong sense of self, confidence and a love of learning. After fifth grade ends, I will forever be their champion, cheering them on from afar, and that is a privilege of great magnitude. How do you recharge? I love to exercise, read historical fiction, hang out with my two children, Tucker (8) and Elsie (5) and walk my geriatric bulldog, Bully. What’s most exciting about your professional life right now? Your personal life? Last summer I spent a week on Beaver Island doing professional development on inquiry-based learning and it really invigorated my teaching. I love approaching topics with my students by starting with a question. That immediately engages them and gives us a purpose for our work. When we give students a chance to engage their natural sense of curiosity it brings magic to the process of learning. In my personal life, I love to travel and take my kids on adventures. The next adventure we have planned is a trip to Orcas Island, off the coast of Seattle. We plan to go whale watching and hopefully see a few seals. Proud to call Erin a colleague at Eberwhite! Her positive attitude and professional spirit are what make her a beacon of light in the field of education. I’m honored to work with and learn from Erin. As Sally noted, Erin truly is a beacon of light. What a treasure! Well deserved! Thanks to Erin, our son had a wonderful 5th grade experience and was well prepared for 6th. Congratulations Erin! What an honor! I am so grateful to work with you at Eberwhite. I give give Mrs. Wright lots of appreciation. She is my amazing teacher. Something I noticed is she seems to really care about her students. She manages to make us all think and get the quiet kids talk. She’s flexible, funny, and relaxed. She’s the BEST 5th grade teacher ever! Congratulations to an amazing teacher! Proud of you Erin!! Any parent lucky enough to have their child attend one of Erin Wright’s classes knows how good she is. I’m proud to say I am her uncle and have experienced how she works with her own children. Erin’s grandmother and aunt were both teachers and at least two of her cousins are also teachers. In a capitalistic society, compensation is one way we acknowledge the importance of one profession when compared to other professions. On that basis we don’t think teachers are very important. Besides parents, teachers are the greatest influence on our children but we still are unwilling to give them the tools they need. Wait up Lansing!!! Quit comparing one districts compensation to another to determine fair compensation.